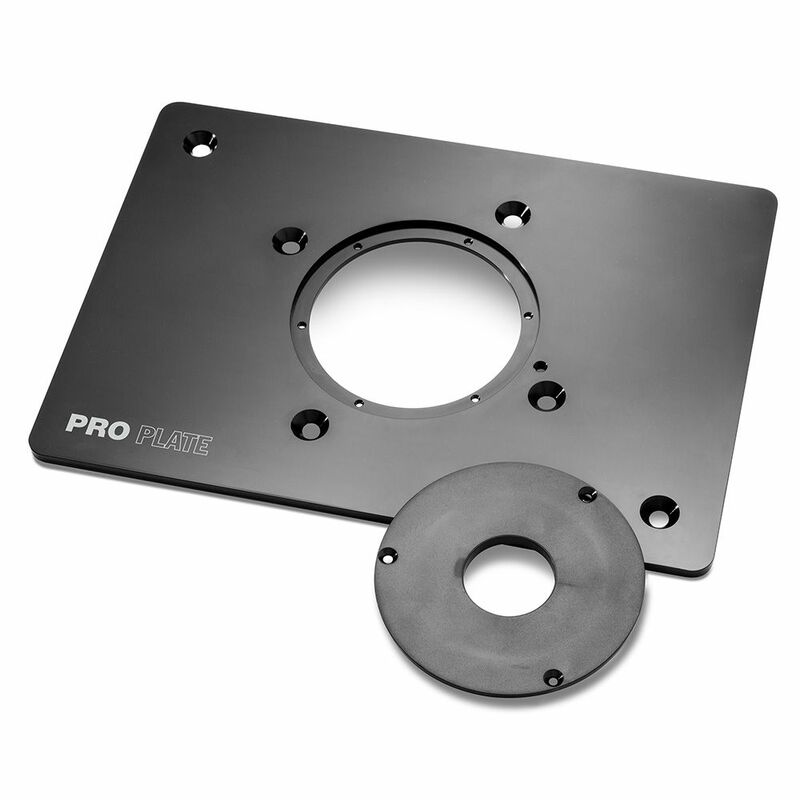 Rockler Pro Plates are CNC-machined from solid aluminum for the utmost in flatness, precision and durability. A router table insert plate makes it easy to lift your router out and set it on the table for comfortable bit changes, height adjustments, maintenance and even to use your router free hand or with a straight edge guide. It saves you from a lot of backaches, squinting and bumps on the back of the head from stooping under the table. 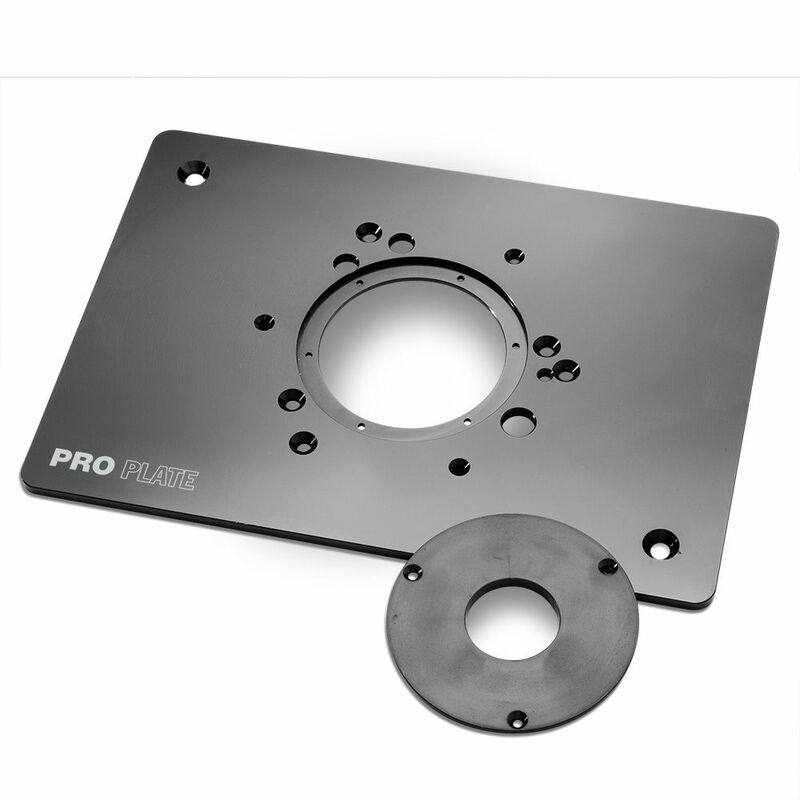 Our Aluminum Pro Plates are CNC-machined for flatness, will not sag, and are generously dimensioned at 8-1/4'' x 11-3/4''. They work equally as well with shop-made router tables as they do with Rockler tables, and fit both our current tables and most of our old tables as well. 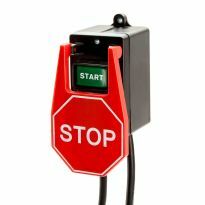 Additional insert ring sizes are available (sold separately). Plates A & B accept Standard sized rings. Plates C & D accept Large sized rings. Which Router Plate Do I Need? To choose a pre-drilled plate, find your router below. Note: Current models of the Porter-Cable 892 require at least two screws to be 1/2" long versus 5/8". 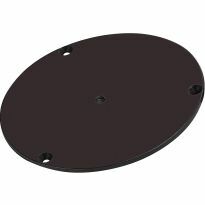 If your router is not listed: Choose from two non-drilled plates-one with a 4'' insert ring (#56935), and the other a 4-3/8'' insert ring (#50850)-and drill the plate to fit your router. 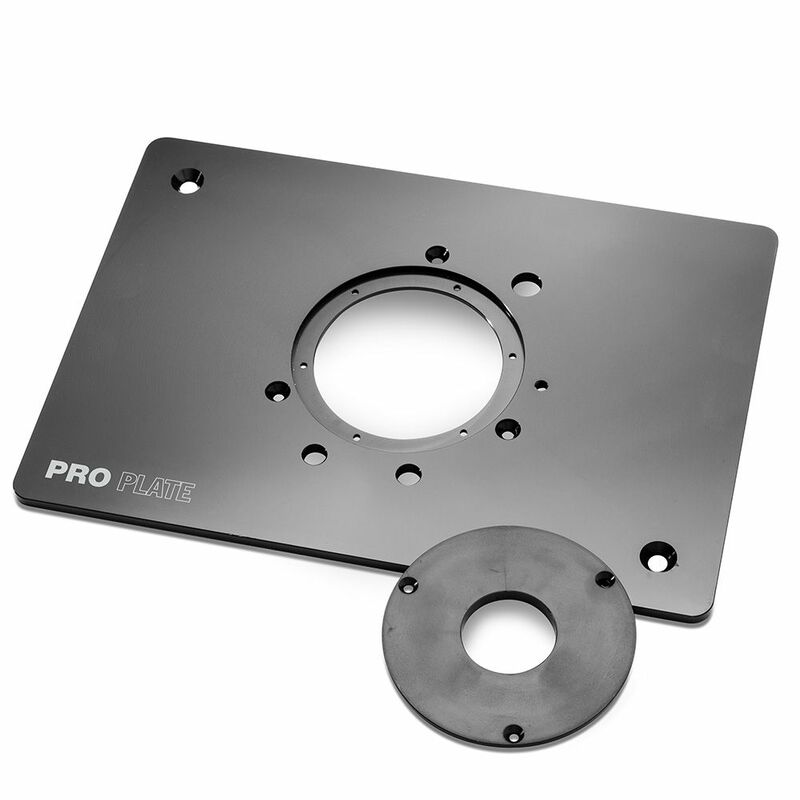 For customers making custom router tables, we recommend the Router Plate Leveling and Locking Hardware Pack (#22994, sold separately). Leveling screws not included with router plate, they will be included with table top. awesome plate for the work table i built. wish it was pre-drilled for the bosch router being that i am a far cry away from being that precise to drill matching holes. But it worked and i am happy as can be. Just finished making a fence for it and can't wait to really use it..
Quick and easy instal. Great plate that’s nice and solid for my Dewalt 618. Strong and easy leveled. I wish it had been pre drilled for my Triton router. This plate lined up perfectly with my Triton router. Plate is well made with no deflection with router attached. Came with all hardware needed to install. The only thing I had to do was drill one hole in top for the router crank but was easy to do. This item was easy to install. I do wish there were more rings to accept different router bits and close up the gap between the router bit and the rings. High quality aluminum.. As flat as can be. Have a Husky (Home Depot brand) table that I use as a portable router table in a small wood shop. Original insert was a plastic type that, I discovered, had significant flex due to router weight. I found that routing depth was inconsistent on pieces. I installed this aluminum plate and now have zero flex and much better results! Only wish this plate had 4 mounting holes in corners rather than just the two. I re-drilled the plate freehand as needed but was slightly off (should have used drill press.) Plate still works very well I am very pleased with results. I gave this router plate a five star rating as it is very smooth and easy to use. I will say that if allen screws were used I think it would be nicer. Also the two big countersunk holes in the corners could be expanded to all four corners and it would add some versatilely to the mount. for the users need. Overall it is very good. I needed a router plate that would not sag with the weight of the router and one that would also stand the wear and tear of sliding in a leveling jig. The Pro Router plate is just what I need. Seven years ago I was blessed by a co-worker with a gift of a Craftsman Router and Craftsman Router Table. Unfortunately, the router was incompatible (mounting holes didn't line up) and modification was made to make it work. Recently the router died and I replaced it with a Hitachi. I figured as long as I was upgrading to a better router, might as well make a better (more functional) router table and attach it to the single largest tool in my garage so it does not take up any additional space! Might yet enclose the router in a cabinet so I can attach dust-collection and store router bits and such. This router plate is very nicely finished. I wanted an aluminum plate at least 3/8" thick, but that was a lot more costly. When this plate arrived, I realized that it was plenty sturdy at 1/4". I would not hesitate to recommend this to anyone. Works. What else do you want? Was looking for a good system to mount my router with. This is as the title states, nice and sturdy. Made the table top first, mounted the plate and router and used that to fabricate the cabinet underneath. This plate is rock solid. Have it on my TS extension, with my home made lift. holes were dead on for my PC router with above table adjustment . Will be buying another for my stand alone router table. Solid foundation for a router table. This is the 2nd Rockler router plate I've had- 1st one got lost in a move... so there was no question in my mind I wanted another one. The first one mounted a small Porter-Cable router in my router table, this one will mount a 2.5 hp Porter-Cable. It is just a touch larger than the last one, so will have to open up the recess on my table just a little, no problem with Rockler's matching router bit. 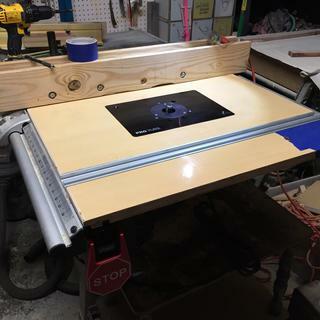 I made my router table top out of a scrap of Melamine counter top, works perfect! The Rockler Aluminum Pro Router Plates is terrific, I also purchase the router table at a Rockler distributor and the plate fits perfect. I am happy with it all. Works as expected, but I now need larger diameter insert to accomodate wider router bits. Had to drill two corner holes to stabilize the plate in the table. Otherwise did the job. Aluminum is nice wishing for hold down in all corners. Glad I chose aluminum. Nice heavy duty plate. The only thing I didn't like is my old plate had screw downs in all four corners, but this only has two. I spent quite a bit of time trying to get the two unsecured edges to lay perfectly without give. This router plate works as advertised—almost. It fit my router as advertised, except for the hole for the bit height adjustment. I had to drill my own hole, so now it works. But it would have been nice to have it fit the router the manufacturer said it was made for. I found the plate to be just what I expected; flat, appropriately sixed, etc. I do think that two inserts should be included, instead of just the 1 1/2" opening one, as users who want this plate will want the 2 1/2" plate too. It was a real inconvenience to have to order the extra plate and wait fir delivery just in order to complete a simple task for which the plate was ordered. Charge a little extra if you want, Rockler, but include both plates in the original package. Your customers will be better served, and more appreciative. Aluminum plate feels nice and solid and easily mounted on the router. Like others, had to drill hole for topside fine adjustment for my Bosch router. If you have a Bosch 1614, make sure you have a drill press. Same as Jim D, there was no hole to adjust height for a Bosch 1614. Fortunately there's a great big section of plate with no holes in which to put one. Easy enough to do with a drill press but would have been nice if I didn't have to do it. Otherwise, fit the base just fine with no further fiddling required. The plate finish and material are very nice. The problem that I had was that opposed to other insert plates this one had the holes drilled so that the handles of the router were rotated about 22 deg off center causing them to interfere when inserting it into the router base (other plates had the handles aligned with the long side of the plate). You can twist it to get it in but I was designing a lifter so I had to through away the bottom plate I made. Maybe this is intentional so it might be fine for others but for me it was unexpected. The router plate that I purchased worked well. 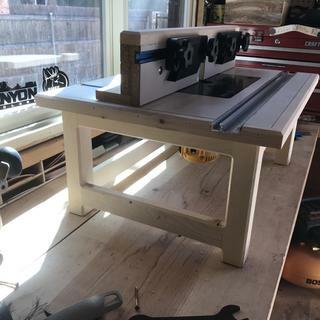 I bought Plate A for my Bosch 1617EVS on a custom router table and top that I built. The plate is nice and everything worked out great. The one major complaint that I have is that the height adjustment holes do not line up properly with the height adjustment on the router itself. In order to use it I will need to drill a hole which I'm not exactly happy about as the product description leads one to believe it will work. router plate is machined to fit a variety of routers, even my old craftsman from the 70's. there are no countersunk screws to mount either the router or install the ring plate. In previous decades I had to make my own plates out of phenolic, which can still be done. 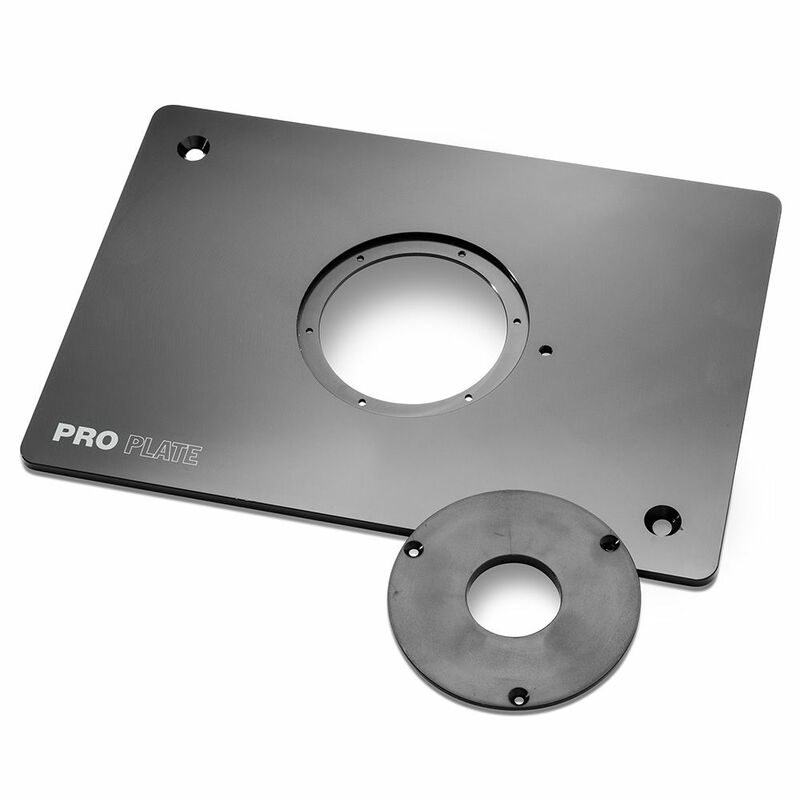 This predrilled aluminum plate makes life easier, though, and the aluminum construction makes it very rugged. I ordered a class C plate to fit a Triton router, and it was drilled accurately, though I needed to drill an access hole for the height adjuster. My box was missing the extra insert, but Rocker sent out the right one within a couple of days. The included screws worked fine. It's easy to make your own router table using this plate, which I did. The price is a bit high, frankly, but if you make your own table this is really the only piece of hardware you need to buy. If you can get over the price, the quality won't disappoint you. Template for drilling adjuster access hole from the bottom of the plate. I bought the plate - A for my new Bosch 1617 router and homemade table. Being lazy and relatively new to routers, I also bought the Rockler template for the plate. Everything went fine except even though the Bosch 1617 is listed for plate A, I was surprised when there was no hole to access the above the table height adjustment. I guess I will drill a hole but a factory hole would sure look nicer. I'm very happy with this buy. Its a very nice, well made Plate. Worked well on my self made router table. When I found that my old polycarbonate router mounting plate was flexing I had ruined about 20 minutes of work. I have to adapt the plate to fit my router table but that will only take a little work. I am happy that this plate domes with a starter pin. Fits the Triton router perfectly. Nice finish on the surface. Only complaint is that I had to drill a hole for the lift mechanism access. Wish it came with a blank insert as well. My 7539 is a large router and the old phenolic plate had finally sagged. Time for an upgrade. I am building my own router table. I need to build a router table. I like the idea of a premade aluminum plate for my craftsman router. I needed a plate for the router table top I just ordered. Wanted a plate that was durable than plastic. going to buy a Triton (TRA001) Router in the future, Willing to pay $250. Can you do this? Bought a Performax router from Menard's it has a 4"5/8 center to center mount pattern which matches Craftsman. Building a router table for my own HPL top. Sometimes a perfect fit is worth paying for. I choose this plate after a great deal of reading and research. The plastic insert plates did not seem as sturdy. My Bosch 1617 is relatively heavy. I want my tools to last perform over their lifetime. I hope the investment into a custom router wing for my table saw works out. Good reviews and I'm upgrading my home made setup. I intend to build a router table for my burgeoning wood shop, so a plate is the least you can start with in order to make the access to the router from the top of the table possible. Also, a flat solid surface is a must for accurate milling. Perfect centering of router. NO warping. using now is not flat. 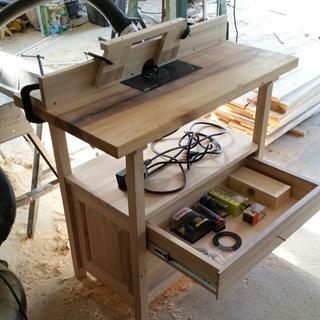 to finish making a router table top and table. Seemed to be a better plate than the standard plate for just a little more. It seemed worth it. I purchased your router table and the plate that came with it did not accommodate my Freud router. Rather then drill holes to match, I'll use one for another router and this other one for the Freud. I prefer Aluminum to other materials as it is much sturdier. I think aluminum will hold up much better than phenolic plates I looked at. I ordered this router bit to prevent sagging with my heavy router. This and the support framing I have placed under my table top will make for a perfect combination of stability and quality. great product for my router and homemade table. if your are making your own table you cant go wrong with this metal plate. I own new DeWalt DW26204 router. Which of plates I need to buy? I have a craftsman 320.27683 will Plate B fit? do you have to drill a hole for the Triton lifter handle ? 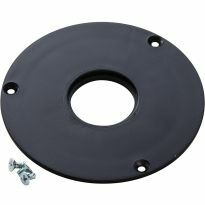 Will the "A" plate fit a Bosch 1617 evspk? Yes it will. Answers for most questions about router fitment are in the product header. Yes - BUT, there is no hole that I could find for the above the table adjustment. I have the same router and I agree. I had to drill my own for the above table adjustments. Would this work for a Hitachi M12V? Will one of the predrilled router plates fit a Skil 1830? If none of the predrilled plates fit a Skil 1830, which of the non-drilled plates would work? What plate for a ryobi 3hp variable speed router? BEST ANSWER: Suggest you call Rockler for the answer to this one. Sorry I don't what plate to use for this router. Which plate for bosch 1611? I had to return mine because I ordered the wrong plate. This is not an answer. Which plate is correct? i have a Craftsman 315.174921 will plate B work for me? Do these plates fit the Bench Dog cast iron router table opening? BEST ANSWER: yes, these have the same 8-1/4" x 11-3/4" plate size as the Bench Dog cast iron table. They are the same plates with different logos. Bench Dog and Rockler Pro plates are made by the same manufacturer with different logos. I need a router plate to mount Makita 2301 Fc. Also the hole should be big enough to fit raised panel bits. Which router plate should I choose ? BEST ANSWER: The biggest plate insert I have has the 2-1/2 inch opening and it is to small for the bit I have for making raised door panels so I remove the insert to make my doors. which plate for Milwaukee 5615-80? If neither fit you can purchase 56935 and template your Router and drill the insert to fit your Router like I did to fit my Sears Router. Just make sure you measure the dimension of the Router to fit the insert. 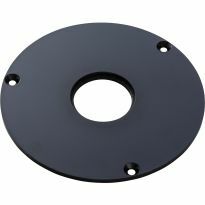 On the Rockler website there is a section for router plates. 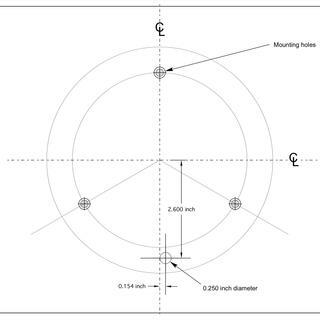 Four documents show the hole pattern for the standard plates A through D. If none of those patterns match your router, you should order the blank plate and drill mounting holes to match your router base. Sorry, can't help because my router is a Craftman and it fits with the Dewalt set up. All I did was follow the "A", "B", & "C" options in the directions. I am not sure whether Mileaukee router is listed. You would have to buy a blank plate and drill your own holes. 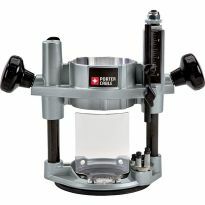 With the Aluminum Router plate C, using the Triton TRA001 router, are any addition holes required to be drilled to facilitate the above table raising and lowering apparatus on the the router? BEST ANSWER: Based solely on looking at the picture for Plate C, there are no holes for the lift handle. Which plate is recommended for Bosch MRF 23EVS? BEST ANSWER: I'm not sure, I modified one of the plates to fit my Harbor Fright 1/2" I took my time measured several times then drilled the new holes to fit my router. Its working out well for me so far. Will this fit a Bosch MRC23EVSK and a Porter Cable 691? Also is there a pre drilled hole for the Bosch and lift? I have a bench dog phenolic table. Does rockier have a plate that will fit the opening? I'm planning to use this plate in combination with Leigh e-bushing and Bosch 1617 housing. 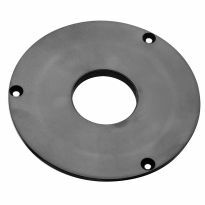 What about cenering insert plate? 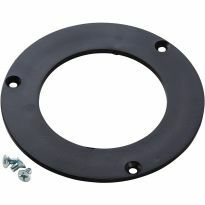 I am planning use the 'A' plate with a Porter Cable 7529 and a Router Raizer on a router table I am building. 1. 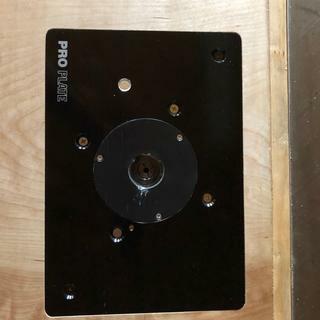 Looks like the plate does not have a hole predrilled for the Router Raizer, it has other holes none lines up with the Router Raizer access, is there a different plate with a predrilled access hole for the Router Raizer. 2. 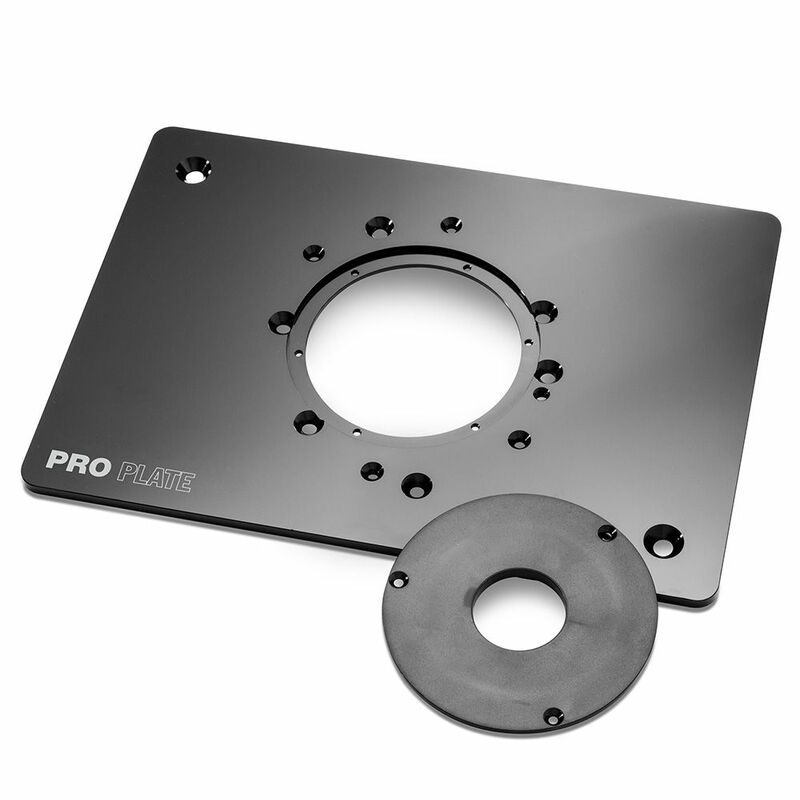 The original face plate has to be removed for mounting the PRO PLATE, or the plate should be mounted on the original face plate? What kind of nuts can I use for the two plate mounting screws. Appreciate the help. BEST ANSWER: I HAVE A MAKITA ROUTER AND ORDERED THIS PLATE WITH THE SAME PROBLEM YOU HAVE. I HAD TO DRILL HOLES AND TAP TO MAKE IT FIT. ONLY PROBLEM AS I RECALL WAS CENTERING MY BASE PLATE FROM MY ROUTER. ANYWAY IT TURNED OUT FINE AS I HAVE BEEN USING ON A REGULAR BASIS. I can only tell you about the quality of the plate since I ordered the wrong plate for my router and returned it. It is well machined and stiff. A great product if it fits your router. The only thing I could think of is to try to find a different rotor plate. If the A plate won't work find one that will. If not figure out how it would work with the one you have. 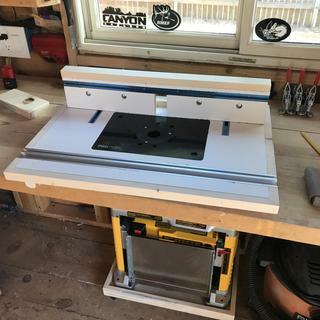 I bought the pro plate for my Rockler router table. However, the opening in the table is deeper than the plate. How do I bring the plate up to the level of the table top? BEST ANSWER: I used four EZ-LOC inserts and four flat head screws (matching the EZ-LOK inserts) at each corner to adjust the plate to level with the table (leveling the plate to the table). A little thread lock on each screw will keep it from “walking” from vibration. This is a very good plate and the easiest and best way to level it up is a leveling kit also sold by Rockler. I actually machined the pocket in my table deeper, then used the leveling screws for fine adjustment of the plate to table top. My table has leveling screws on each corner of the plate cutout. If your table has these screws, use them to raise and level the plate. If your table does not have the screws, you can easily add them. how thick is the aluminum plate? BEST ANSWER: The heavy duty Pro Plate is 1/4" thick. The only routers that I am aware are compatible are Porter Cable 690 series, all Bosch except Colt, and Dewalt. I had a Skil router so I solved the problem buying a Porter Cable 690.to use in the table. Yes, I also have the Freud 3000 and it fit perfectly. I have a Dewalt 616, and when I look at the router it's base is mounted with 4 screws, the plate A only looks like it has 3 holes for mounting. Am I missing something? can it also be mounted with a 3 hole pattern? BEST ANSWER: Your unit takes one of the other units. It might be the B, C or D version. Double check with the spec sheets to see which one it belongs.. It is not obvious the way the web site handles the distinction. If all else fails use item #56935 and drill your own..
You want to order the Rockler Plate A. It has the mounting holes for your model.It will have a number of holes that other models use as well. I think the plate that is pictured on Rockler's page is just a stock photo. what's the two countersunk holes in two corners for ? BEST ANSWER: They are for the screws that lock the plate to the table top. There are multiple leveling screws underneath, two in each corner and 4 in the middle areas. Those are for screwing down the plate to the table. 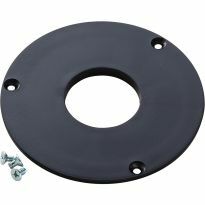 does this plate have a predrilled hole for porter cable router height adjustment? BEST ANSWER: No, you have to drill it. Yes, holes are dead on. You won't be sorry if you purchase it. Will this work for the Milwaukee 5625-20? BEST ANSWER: The Rockler router plate worked well with my Milwaukee 5625-20 router. The hole match was right on. I had to drill a hole for the t- socket wrench that adjusts the bit height from the top of the table but everything can't be drilled in the plate for all of the routers that attach to the plate. 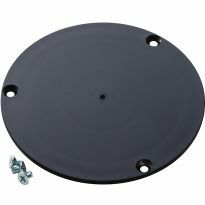 Does anyone have the spec for the two holes to attach the plate to the table (upper left and bottom right) location and diameter? All the plates appear the same, but specifically plate C.
BEST ANSWER: The two attachment holes are "universal" and come with attachment screws and instructions for for table tops that may not match (rare) or if you make your own table top. The 'A', 'B" and 'C' configurations relate to the holes around the center opening and are designed to match the particular router you have. Right, nice equipment that! I made mine the old fashioned way. They are 3/8" holes offset 1" from the top and the side. If your CNC only takes metric that is a 25.4mm offset from the top and from the side and a 9.5mm hole. I don't have an answer to this. The router plates I have are B & D plates. I wish I could help. do you have a plate to fit desalt D26204? I have a Craftsman 320.17543 will plate B work for me? BEST ANSWER: Hi Josh. Without knowing the dimensions of of your Craftsman unit I cannot give any advise regarding your question.